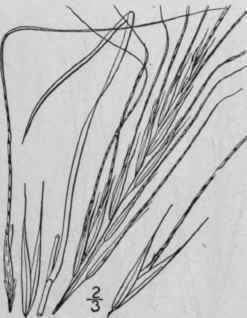 Stipa viridula Trin. Mem. Acad. St. Petersb. (VI.) 2: 39. 1836. -Stipa spartea Hook. Fl. Bor. Am. 2: 237. 1840. Not Trin. Glabrous, culms 1 1/2°-3° tall, erect, simple, smooth. Sheaths shorter than the internodes; ligule 1"-2" long; blades smooth or scabrous, the basal ones involute-filiform, one-third to one-half as long as the culm, those of the culm 3'-9' long, broader; panicle spike-like, strict and erect, branches appressed; outer scales of spikelet 3"-4" long, long-acuminate, glabrous; third scale shorter, more or less pubescent with long appressed silky hairs, callus acute; awn 3/4'-1 1/4' long, bent, loosely spiral at base. Meadows and prairies, Athabasca to Minnesota and Colorado. Wild Oat-grass. July-Aug.
Stipa avenacea L. Sp. PI. 78. 1753. 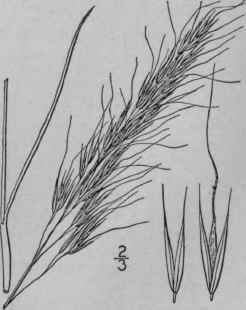 Stipa barbata Michx. Fl. Bor. Am. 1: 53. 1803. Stipa virginica Pers. Syn. 1: 99. 1805. Stipa bicolor Pursh, Fl. Am. Sept. 73. 1814. Culms glabrous, 1°-2 1/2° tall, erect or leaning, simple, smooth. 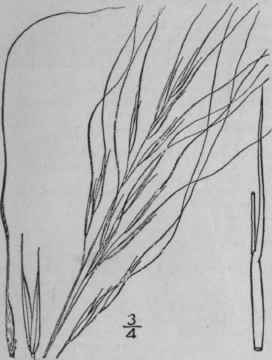 Sheaths shorter than the internodes; ligule about 1" long, obtuse; blades involute-filiform, smooth beneath, scabrous above, the basal one-third to one-half the length of the culm, those of the culm 3'-5' long; panicle s'-8' long, loose, the branches lax, erect or finally spreading, naked below; outer scales of the spikelet 4"-5" long, acute, glabrous; third scale a little shorter, scabrous near the summit, black, pilose at base and with a ring of short hairs at the top, otherwise smooth and glabrous; callus hard, acute; awn 1Y-2Y long, bent, loosely spiral below. In dry woods, Massachusetts to Wisconsin, Florida and Texas. Feather-grass. May-June. Stipa comata Trin. & Rupr. Mem. Acad. St. Petersb. (VI.) 5: 75. 1842. Glabrous, culms 1°-2° tall, erect, simple, smooth. Sheaths usually longer than the internodes, smooth or scabrous, the uppermost very long and inflated, enclosing the base of the panicle; ligule 1"-2" long, obtuse; blades smooth or somewhat scabrous, the basal involute-filiform, one-quarter to one-half as long as the culm, the culm blades 3'-6' long, a little broader than the basal ones, involute; panicle 6'-9' long, loose, the branches 3-5' in length, erect-ascending, naked at base; outer scales of the spikelet 9"-12" long, glabrous, acuminate into an awn 2"-4" in length; third scale 4"-6" long, callus acute; awn 4'-8' in length, slender, curled, spiral and pubescent below. Dry places, Yukon to Iowa, Texas and California. Porcupine- or Blow-out-grass. Needle and Thread. June-July. S. spartea Trin. Mem. Acad. St. Petersb. (VI.) 1: 82. 1831. Culms glabrous, 2°-4° tall, erect, simple, smooth. 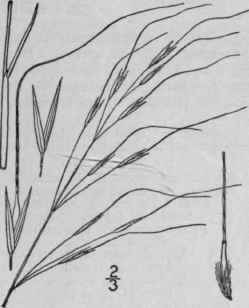 Sheaths longer than the internodes, smooth or somewhat scabrous; ligule 1"-2" long, obtuse; blades smooth beneath, scabrous above, the basal one-third to one-half as long as the culm, 1" wide or less, usually involute, those of the culm 6'-12' long, about 2" wide, generally flat, attenuate into a long slender point; panicle finally long-exserted, 4'-10' in length, its branches 3'-6' long, erect, naked below; outer scales of spikelet I2"-i8" long, acuminate into a long slender point, glabrous; third scale 7"-12" long, callus acute; awn 4'-8' long, stout, usually twice bent, tightly spiral and pubescent below, doubly spiral about the middle. On prairies, British Columbia to Michigan and Kansas. June-July.